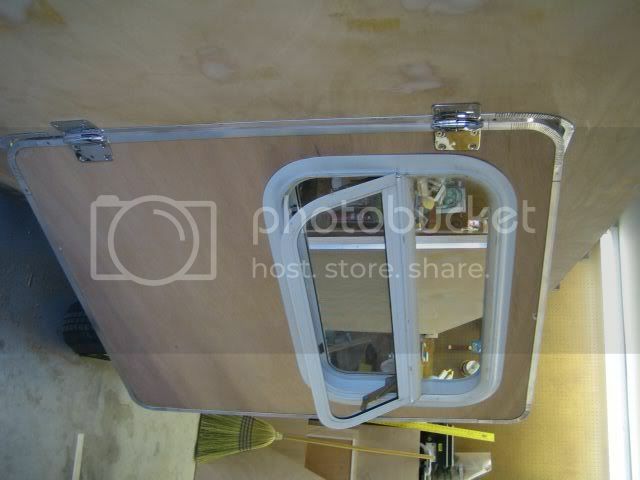 Teardrops n Tiny Travel Trailers • View topic - I need a door trim close-up photo!!! 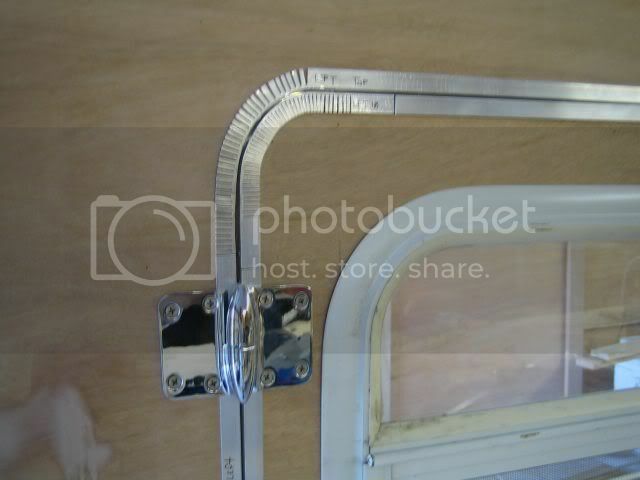 I need a door trim close-up photo!!! I am trimming out my doors and opening now. My first try with it really didn't work out. I am pulling off my first-try trim and doing it again - right this time. Can somebody please post a couple of nice close up photos of their door trim? I have the Cubby plans, but the close-up photos aren't that great. I could really use a few nice shots of where the angles come together in the corners and how the t-molding meets on the ends. It would really help me out, and I am kinda stuck until I get this figured out. I have square doors so I'm not sure pictures of my trim is what you're looking for but I can post some pics if you think it will help. I'm workin' on it fer ya. Some of these things are a little tricky to do without some good visualization first. I got one door trimmed out, now I have to work on the weatherstripping! My doors have a pretty tight radius so I had to not only anneal the aluminum, but I also kerfed the radius with a scroll saw. It works better to kerf before you anneal so the scroll saw blade does not grab the softened aluminum. It looks like you are only using angle on your door edge. That means you are using an inside seal, right? Can you post an image of your inside seal? I am using T-molding on the outside, but I think I want an inside seal too. I'm traveling this week so not much progress on the WeekEnder. Back to it on Friday. I am using an oak frame to construct my inside seal. It will be trimmed, routed and finished to add to the inside appearance of the TD. I decided against the T-Molding as it is not available locally and the angled molding is. 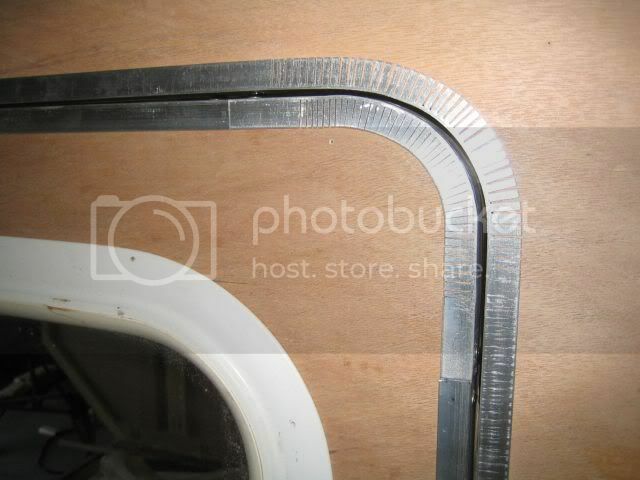 MadJack made a good point of not kerfing the inside radius, and I will try this on the curbside door. I tried annealing a piece for the outer radius without kerfing and it twisted and would not lay down flat when I tried forming it to the door opening. So. I kerfed it and it was very easy to form. Not sure if you still need photos but here you go. I moved my door handle "inboard" so I didn't have to notch the T-molding. I then made a strike plate for the latch. The hinge side of door has two seals, one one the door and one on the door opening. I formed the rain gutter to follow the profile of the door. The perimeter of the door only has the seal on the T-molding. I am happy to say no leaks yet! Purchased all of the trim here. Last edited by Endo on Sat Jun 10, 2006 10:05 pm, edited 1 time in total. Hey, how come those corners don't have gaps in them? Good job on those miters.